According to research cited in Psychology Today, children feel happier when they make a meaningful contribution to the family. In one of the most extensive longitudinal studies of humans ever conducted, The Harvard Grant Study, it was found that one of the best predictors of professional success in life comes from having done chores as a child. Why? What long-term benefits possibly come from helping scrub the john? 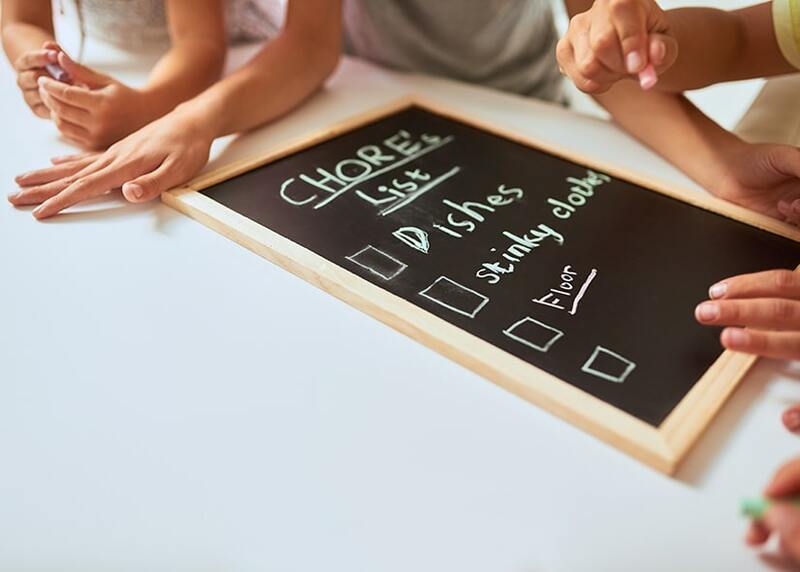 Researchers also have found that children who were given chores at an early age grew into more independent adults, as doing chores builds confidence that they are capable of successfully performing and completing tasks. Another key predictor of success in life, often cited by science, is reading readiness. According to Michigan State University, reading proficiency by the end of third grade is considered a make it or break it benchmark because 83 percent of children who are not reading on grade level by the beginning of fourth grade are at risk of failing to graduate from high school. Surprisingly, further research suggests that reading readiness has nothing to do with workbooks and computer programs. Instead, “it’s the result of brain maturation as well as rich experiences found in bodily sensation and movement. These experiences happen as children play and work. This includes expansive movements such as climbing, jumping, digging, swimming, playing hopscotch and catch, riding bikes, sweeping, running. It also includes fine movements such as chopping vegetables, drawing, building, using scissors, and playing in the sand,” said Laura Grace Weldon, a reporter for Wired. So, lots of the activity’s children do as chores require them to move and to hone fine motor skills. The ability to work and get along with others also is an important life skill that contributes to success as adults. Dr. Marty Rossman, a researcher at the University of Minnesota, analyzed data from a long-term study following 84 children and found that kids who helped around the house had better relationships with family and friends as they got older than children who did not have chores. Completing chores requires teamwork between kids and other family members to get everything done. It also teaches kids the adage that many hands make light work, meaning people can do things more quickly and easily when they work together. Another valuable lesson learned from chores is that of delayed gratification or, work first, play later. Psychology Today noted people who learn how to manage their need to be satisfied in the moment are more successful in careers, relationships, health, and finances than people who give in to instant gratification. It’s really about self-control. Learning self-control early can help you as an adult, so you don’t buy things on impulse and put yourself into debt or complain when a work assignment unexpectedly changes. Finally, chores allow kids to feel important because they are contributing to the well-being of the family. We all want our lives to have meaning, and children are no exception. Think about how excited a toddler is to help you with everything? Do you encourage and welcome their help or are you reluctant to allow the toddler to help because they might hurt themselves (e.g., putting away sharp knives from the dishwasher) or they can’t do it correctly (e.g., chopping up vegetables for dinner)? By sending a child into the other room to play rather than help, you possibly are communicating a message that the child is not able to do specific tasks or not wanted. By allowing them to help, you are spending time together, helping them learn how to try, fail, and try again, and communicating to them that they are a valued part of the family and can positively contribute to the family.